The organizers of the Color Orange projects will use the Olympics in Beijing 2008 to visually put focus on China’s violations of human rights. 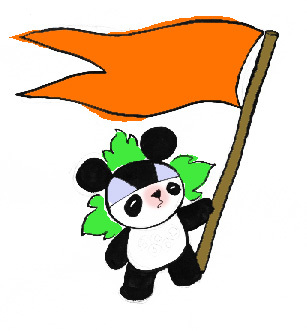 We will use the colour orange and make it a symbol of the protest against the human rights violations in China. Due to the strict censorship it will be practically impossible for sportspeople and spectators to get into the stadium with obvious symbols in form of text or pictures. But no authority will be able to ban the colour orange, although it is obvious for everybody that it expresses a conspicuous accusation against the human rights violations in China. It is the Danish sculptor Jens Galschiot and his art workshop (Art in Defence of Humanism, AIDOH www.aidoh.dk) that is behind the ‘Colour Orange’ project. Galschiot thinks of art as nonverbal communication and he often uses his art to make international art happenings to place focus on defenders of humanism. He usually uses his sculptures as artistic manifestations, but as a result of the extremely limited Freedom of Speech at the Olympics in 2008, he has chosen the colour orange. He funds his art events himself mainly through the sale of bronze sculptures to art collectors and he is therefore completely independent from political, economic and religious interests. The project will, through its own dynamics, function as what Joseph Beuys has called a “Gesamtkunstwerk” in which the distinction between the artist, the art itself and the viewer has become blurred. Everybody becomes part of the art.